Hrmm, let's see. Gluten free. Oats. Cranberries. Gulp...flax seeds. And in a cookie too? What? Jeez oh man, what kinda healthy hippie treehuggin' BS are we about to get suckered into by Trader Joe's Gluten Free Oat Cranberry Flax Seed Cookies? Okay, yeah, that's a bit extrreme. But is it okay if I admit I wasn't thrilled about picking up and buying this sixpack of cookies? I mean, I like cookies in almost every way, shape and form...just ask my family around the holidays...but, this? These don't sound like a treat to me. 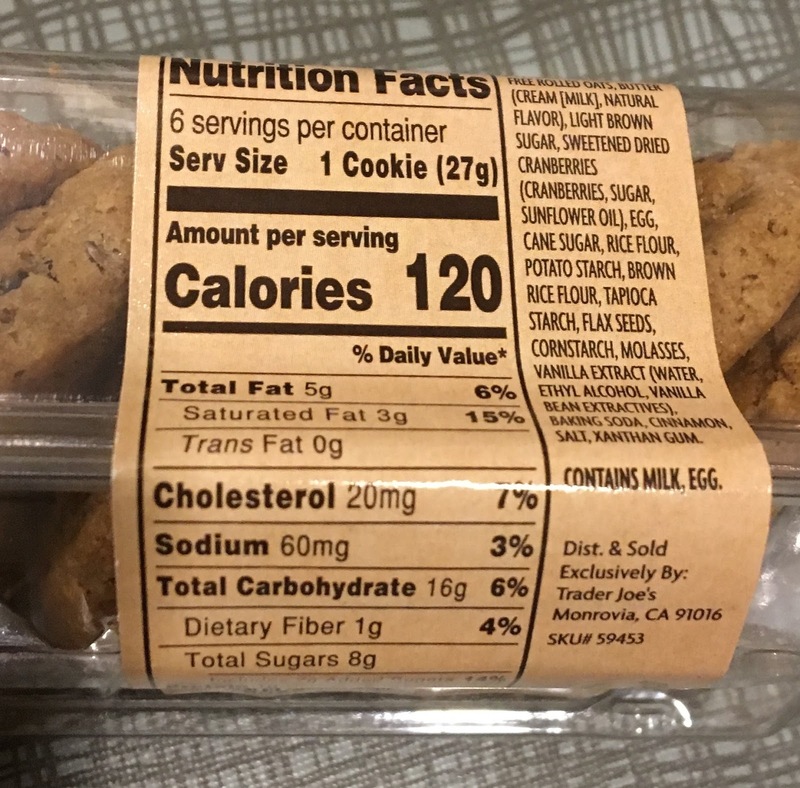 Instead, these cookies, on first pre-sampling impression, seem to be one of those gimmicky "Well if you're gonna eat snacky doodads, make them healthy ones!" products that seem to always suspiciously spring up right around New Years. Jumping Jack Flash, these are a smash, smash, smash. Seriously. These are awesome. I can think of no other word. Usually when I think "gluten free" I think stiff and cardboardy (or in the case of most anything made with rice flour, damp newspaper-y), but that is so absolutely not the case here. Soft, crumbly, slightly chewy, as if they're almost pulled from the oven, the texture on these cookies is simply unbelievable. From pure mouhtfeel standpoint, these are amongst the tops I've ever laid my teeth too. And that's saying a lot. The oats make a good earthy base for the batter, perfect for the slight tartness of the cranberries to stand out. I almost wish there was a nut like some almonds just for a little added harvest-esque touch, but the cookies don't suffer much from their absense. To be honest, I didn't notice the flax seeds much one way or another, so I'll take that as an overall positive. Can't let too much hippieness get between you and a good cookie. I'm impressed, Sandy's impressed. Gonna stock up on these suckers and try to hide from our growing group of kiddos. These are some of the rare store bought cookies that I know I couldn't make better myself. It's been a while since we've crowned something as an inner circle hall of famer, but it seems due now. Ladies and gentlemen, boys and girls...a perfect score. Now go out and get 'em! Exciting! I'm a gluten-free baker and the flours being created as substitutes make excellent cookies, muffins, and cakes. Yeast breads still have a long way to go. But these look yummy - I pick some up on my next trip, if my local store carries them. My mom is gluten free, I will have to get her a pack of these. Have you tried Trader Joe's box of allergy friendly snickerdoodles? They are amazing! I'm not a big cookie eater but even that said the entire title of the product does not entice me in the least. If I'm going to eat a cookie it better be one awesome cookie LOL. Does sound like an excellent product for those Cookie Monsters going gluten-free though. Wow. A cookie rarely gets a 10/10 review! Guess you can’t jushe a cookie by its description! 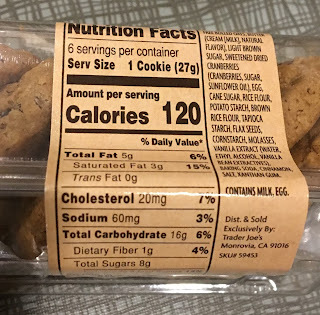 I totally jeopardized the remaining shreds of my sanity at the UWS location of trader joe’s yesterday and i just giggled to myself at those cookies imagining they were one of those terrifying health food store “cookies” that make you question if it’s worth living longer if you have to eat that kind of cookie. I’m not GF but will certainly give them a try on my next trip to TJs. Oh my gosh! Although this is not related to this post I just had to comment because I couldn't remember if you guys had reviewed this product before. My Seattle Trader Joe's finally got the Sumatra coffee chocolate brownies in stock in the bakery section. They are so good. If you haven't reviewed them I would love to see your viewpoint on them. I did as I was told and bought these last night based solely on this review. I was not disappointed! The mouthfeel is amazing and the flavors spot on too, the cranberry was not overpowering at all. Overall delicious and will buy again! They didn't quite live up to 10 out of 10 for me. Very tasty but the one I tried felt undercooked with a gluten-free wet sand texture. I'll try putting the rest in the toaster oven, but still at least 8 out of 10 for mixing healthy flavors to yummy effect. My GF standards are so high I quit eating cookies. At Trader Joe's they seem to go in for crispy cookies, not what I am longing for. We have to travel several hours for a TJ so we pick up things to try and hope if they are good just hoping they will have them next trip. (We have tried several stores in two states and have never gotten there when they had the cauliflower gnocchi!) Because we can only shop there as we are on our way somewhere else. I limit sweets but I tried one in the car and only two cookies made it home last night with us and I scarfed them both with my breakfast coffee just now. So good they should be illegal or maybe they lied and there are allergens lurking inside. I can't chance letting anyone else here know just how good they are! And how can I engineer another trip that leads us by a TJ? Has anyone figured out the recipe?